Time travelers from the 1890's, or Maker Faire 2015? Shannon O’Hare, aka Major Catastrope, is our fearless leader. A natural artist and craftsman, Shannon’s experience as a theatrical prop maker and set designer, and sense of improvisation, inspires our crew. Tim O'Hare is the senior brother of the trio. Retired from the railroad industry, he lends his expertise in motors and machinery. Graduate from the Hibernian Academy In Industrial Arts, under apprenticeship of the great Geppetto. Mike Snowden shares his woodworking skills and builds amazing objects from deceased trees. Samuel Coniglio, aka Dr. Professor Samuel Tweed, and Katherine Becvar, aka Katherine the Great are adventurers. 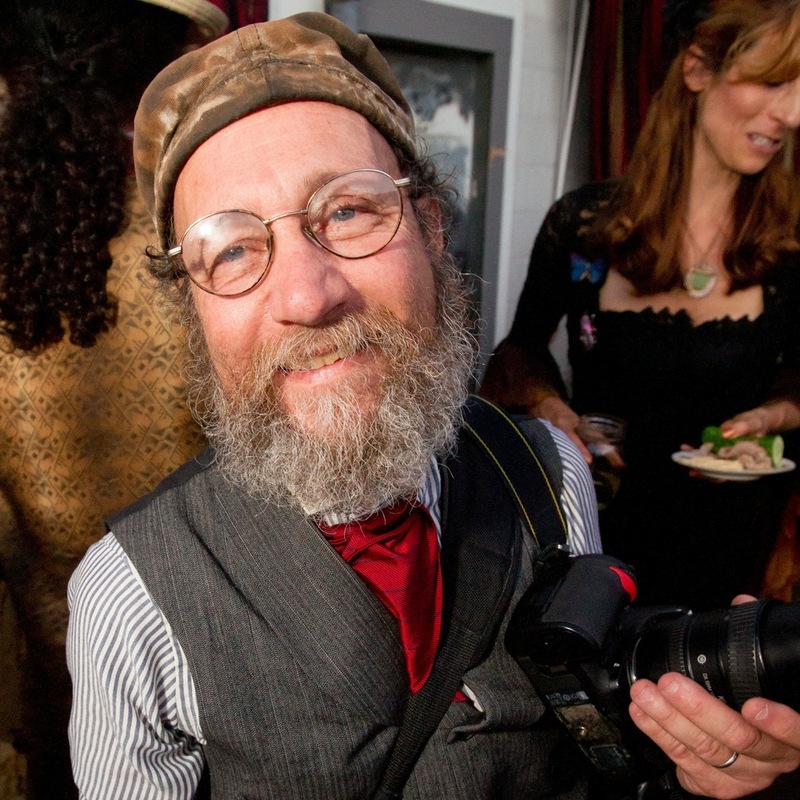 Samuel is an avid photographer, bartender and amateur tinkerer. He manages the Obtainium Works website and helps with the media. Katherine is the Librarian of the Neverwas Haul. She is also a great organizer and artist. She also makes great costumes and runs a costume accessory business. Trevor and Karen are recent immigrants to Hibernia. Accomplished story writers for the theatre, they help organize events and plays in and around Obtainium Works. Bill Richard is our security officer at Obtainium Works. A Jack-of-all-trades, he understands machinery and electronics and assists in making things work. Andy and Judy Pischalnikoff come from the northern region of Hibernia. Andy is a photographer and proficient user of the Kimric fire cannon. Judy is a costume designer and artist. 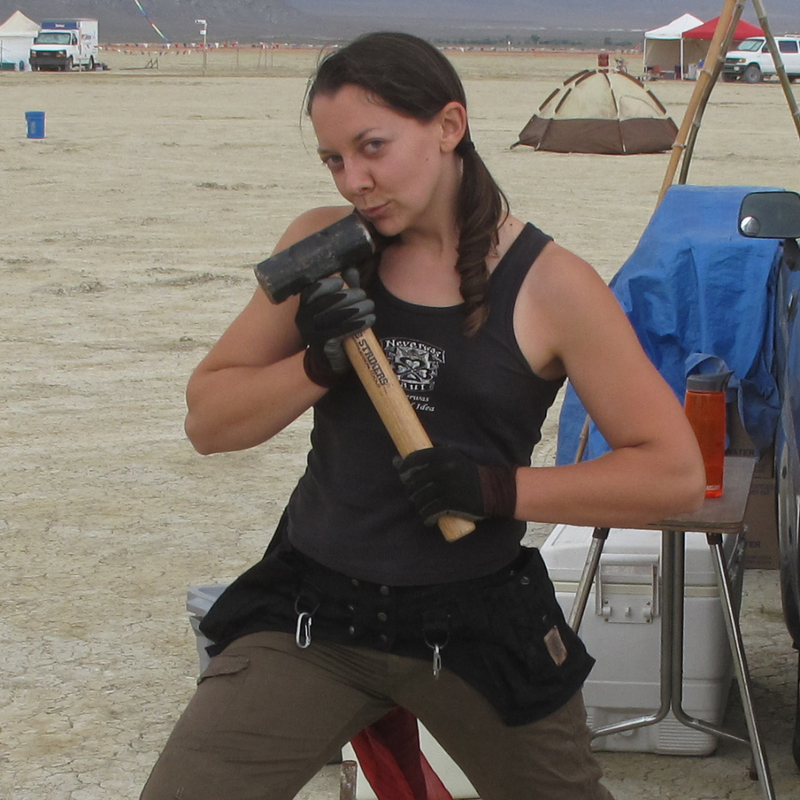 Beth is our newest Track Banshee and Wrench Mistress. She is fluent in woodworking and mechanical things. Cris is a rough and ready sailor who has traveled the Seven Seas! Matthew O'Brien is a sturdy Merchant Marine who can cut and bend metal with his bare hands! This long lost child of Hephaestus has helped build many an art car at Obtainium Works. Kimric Smythe and Autumn Kruse are like two poles of a magnet. Kimric was the chief engineer of the Neverwas Haul, the Steam Car, and is a legendary Burning Man/Survival Research Labs prankster/artist/engineer and pyrotechnician. Autumn runs the numbers and speaks Russian. Both love the obscure and the odd. Kimric owns an accordion repair shop and Autumn has her own accounting business. David Apocalypse and Jenny Schmenny are two peas in a pod. 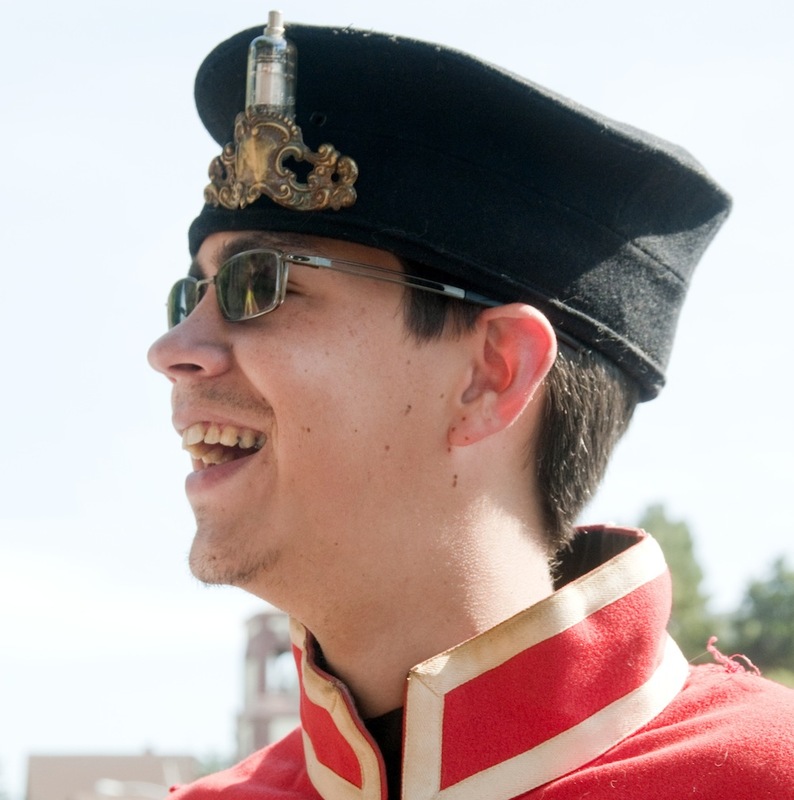 David is a long time prankster, megaphone superstar, and Circus Carny. Jenny helps keep David sane. Mr. Liam McNamara is an engineer, builder, and collaborator with Kimric Smythe. He was part of the original build crew for the Neverwas Haul. Matthew Snyder aka Hazmatt is a metal fabricator and designer. Part of the original build team, he made the ornamental metal features of the Neverwas Haul, the finger-eating folding stairs and some of the structural metal. He emigrated from Hibernia and now resides in North Carolina. His fabulous cheeses will be missed. Kathy O’Hare, aka Lady Impetuous, is the chief “cat herder” and logistics expert for the Obtainium. She also cooks awesome meals! Kevin O'Hare is the middle brother of the O'Hare clan. A fabulous artist who knows how to make Victorian contraptions work like new(ish). He runs a pewter shop called Fellowship Foundry. Steven Jacobson is another of our wonderful photographers. He also helps around the shop. Joe Phillips, aka Professor Horatio Birdbath, is chief driver of the Neverwas Haul. A mix of machinist and handyman, Joe has helped on almost every major project at Obtainium Works. He also makes great cocktails. Grego found his family at the Hibernian Empire. He discovered us at the Obtainium Cup. His magical art car inspires everyone wherever he goes. A fantastic artist, he creates trophies, goggles and other amazing Hibernian contraptions. His skills with the Marconi sound system are musically mellifluous. Sir Victor and Lady Ofeibia are very handy! Victor is an expert mechanic and fabricator. His thoroughness of detail has improved the quality of many projects. Lady Ofebia always lends a hand in every project we do. She is also lovely dancer. Andrew Autore is a recent graduate of the Hibernia Merchant Marine Academy. This young engineer and mechanic has done wonders to get the Haul working. “Dr." Hitchcock is secondary bartender and curer of what ails ya. Master of gaffer tape. Spiritual advisor for the Cthulhu mythos. Oliver Lowe and Deborah Sciales are Hibernian fashion consultants. They are artists and longtime Burners. They help with all sorts of tasks at Obtainium Works. Deborah makes and sells costumes. They are just awesome! Charles von Vitic came out from the mountains and insisted on becoming an intern with the Major. A student of the kinetic arts, he refined his skills under the Major's tutelage. The Great Andres is a master chef. He learned from the Hibernian Culinary Arts Academy and knows how to improvise a meal in adverse conditions. His specialty is bacon, the sacred meat. Leftenant James Carrott is a historian and part of the command deck crew. When he is not driving the Neverwas Haul, he is documenting the adventures of the Hibernian Empire and this thing called "Steampunk." Dave and Vicki Wilson are giants. Literally. And they build fabulous vehicles, like the Chairway to Heaven and the Parlor Car. Don Bruce and Tracy Feldstein, aka Lord and Lady Inebria. Fabulous tinkerers and tincture makers. Built the Ark of Inebriation and several Burning Man art projects.